If you didn't add roofing maintenance to your spring cleaning list this year, you might want to do so now, including cleaning out your home's gutters and extending the downspouts attached to them. Sometimes, gutters clog up with debris that prevents rainwater from draining from your roof properly. The water may back up onto the roof or run down the sides of the house instead. Rainwater can also become a big issue if it pours out of your downspouts and soaks the soil around your basement instead of flowing toward the yard. In this case, the downspouts aren't long enough to direct water away from the house. Here's how you clean out the gutters and extend the downspouts to keep your roof and home safe from excessive rainwater. Clogged gutters can cause many expensive problems for your home if you don't clean them out on a regular basis, including rotting wood in your siding, flooding in your basement and cracking in your foundation. Water that backs up onto your roof may eventually damage your roof deck, attic and trusses. Water can encourage mold to grow in your home, which can also be expensive to remove, especially if spreads throughout your home. Position the ladder below one of your gutters. Have someone hold and steady the ladder for you as you ascend it. Place the bucket of water on the paint tray, then gently sweep out the gutter with your brush. Use your rag and soapy water to wash out the gutter. Pay close attention to the interior and exterior surfaces of the gutter. If the gutter appears rusted or damaged, make note to repair or replace it soon. Complete steps 1-3 with the rest of the gutters. Also, replace any loose or missing bolts and connections between the gutters and the roof edge. These types of problems may cause the gutters to fall off or collapse later. To maintain your gutters and keep them free of clogs, examine the gutters every time it rains. If water runs out of the edges of the gutters or doesn't flow out of the downspouts, you may need to clean out the gutters. Now, you're ready to move to the next step. Some downspouts may not be long enough to empty water away from the home properly. You can solve this problem by attaching extensions to the downspouts' ends. You can find extension pipes at your local home and gardening store in lengths of 3 to 25 feet for convenience. If you have gardens, large trees or shrubs on your property, you may want to extend some of the downspouts to these places as a cost-effective way to water them and keep your basement dry at the same time. It's a good idea that you measure the distances between the downspouts and locations you plan to extend them to before purchasing your extensions. After you install your extensions, you can place large decorative rocks or flowers along their lengths to help them blend in with your landscape. 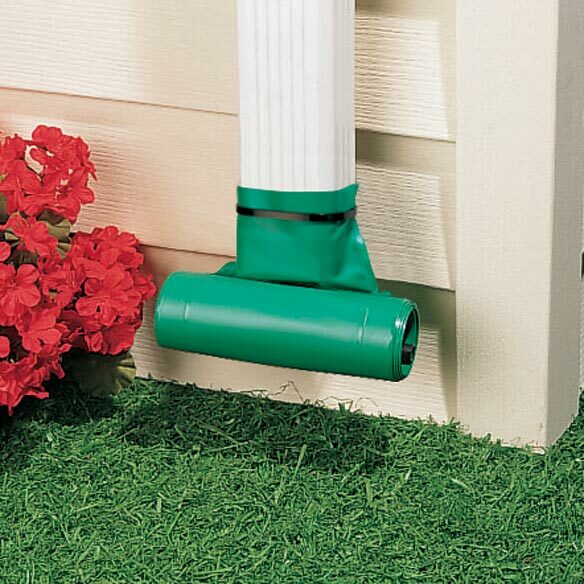 If you have downspouts that can't be extended to anything else on your property, attach roll up extenders to them. Roll up extenders stay in position until rain flows down to the ends of the downspouts. Once the rain pushes against the extenders, they open up to allow the water to flow out of them and away from the home. If you need more tips on how to prepare your roof for spring and summer, contact a roofer from a company like All American Roofing Incorporated.